eBooks are used by millions of people across the globe. They are widely popular because of the flexibility they offer to read any book, at anytime, and from any location. You may come across your favorite eBook in PDF format, in which case you will need a PDF to eBook converter which allows you to convert and read unlimited eBooks. For your convenience, this article shows you an easy way to convert PDF to eBook compatible file types. Wondering how to convert a PDF to an eBook supported file type? PDFelement supports conversion of PDF into eBook supported file formats such as EPUB, HTML, Word, etc. You can also combine several PDFs into one single PDF, and then convert it into an eBook compatible file type as well. With PDFelement, anyone can edit and convert PDF files into eBook file format. What's more, you can add comments, images, objects, and use many other editing tools if needed. You can also convert any password protected PDF into EPub or eBook supported file formats effortlessly. As well, you can use the OCR function to convert scanned or image-based PDF files into editable Word/Excel/PPT files directly. This is a very useful one-time investment that will bring a lifetime of benefit for any book lover. With this program anyone can open, save, print or convert a PDF document into an eBook supported file format. Below, we provide a step-by-step tutorial showing you how to convert PDF into eBook supported file formats. Open PDFelement on your computer. Click "Open File" to import the PDF you want to convert. If you want to convert several PDF files into an eBook supported file format, you need to use the "Combine PDF" option first. In this step, you can easily edit any text or image in the PDF file before conversion. Go to the "Edit" tab and click on the "Edit" button in the top left-hand corner. You can select Line or Paragraph mode to edit any text from a paragraph or line if needed. By clicking an image within your PDF, you can view all editing options in the right side panel. 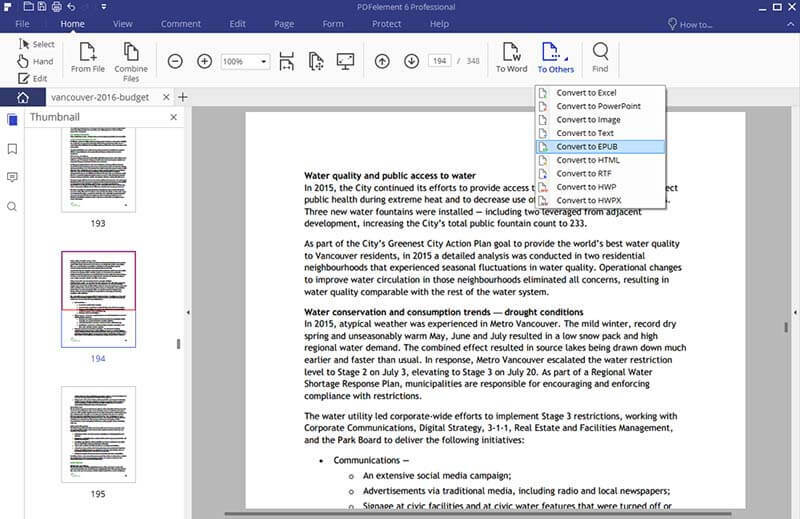 Tips: Whenever you open a scanned PDF document, the program will automatically detect it and ask you to perform OCR; click the "OCR" button to perform OCR and change the PDF file to be editable before converting it. Once all the necessary changes are made, click on "To Others" in the "Home" tab. Select any eBook supported file format, such as "EPUB" from the drop down menu. It will show a new popup window. Here you can select a file destination in the output folder.Finally, select "Save" to convert the PDF file into an eBook supported file format like EPUB.